The Greater Mekong region is one of the biologically richest places on the planet; its varied natural resources support the livelihoods and well-being of millions of people in mainland Southeast Asia. WWF-Greater Mekong – on the ground in Cambodia, Laos, Thailand and Vietnam – is working to conserve the region’s biodiversity and build a secure and sustainable future for people and wildlife. WWF is implementing a comprehensive, large-scale conservation programme that spans 600,000 km2 of the most biologically diverse, economically important and seriously threatened forests and rivers of the Greater Mekong region. Our conservation programme is built on 4 key conservation strategies. Strategy 1: Securing landscape integrity and climate change resilience through integrated conservationeconomic development planning and implementation. 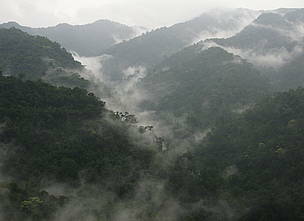 Within the 4 ecoregions, WWF has identified 8 priority landscapes. The primary rationale for the selection of place targets is to ensure that a representative sample of an area’s biodiversity is maintained through the application of conservation and sustainable management. In addition to ensuring that representative biodiversity is effectively conserved, effective landscape conservation can contribute to a number of other desirable conservation outcomes. These including increased resilience to and ability to adapt to climate change and the maintenance of ecological services such as carbon sequestration and the provision and regulation of water supplies. Many of the region’s species face extinction in the next 5 years unless urgent measures are taken to safeguard their populations and habitats. While WWF-Greater Mekong's focal species - tiger, saola, Asian elephant, Irrawaddy dolphin (Mekong subpopulation), Mekong giant catfish, Crested gibbons - represent many of the region’s most threatened mammals, they also have been selected to represent some of the world’s most unique and imperilled habitats and thus provide a basis for conserving these habitats. WWF has a long history of engagement in the region. The organization helped establish conservation programmes in Thailand in the early 1980's and has been active in Cambodia, Laos and Vietnam since 1990. WWF has both the experience and credibility to deliver the critical interventions needed. We are fast reaching a conservation crisis - with several flagship species on the verge of loss and habitats under unprecedented threat levels. Partnerships are more essential than ever before, and a sustainable livelihoods approach is vital with more than 80% of the region’s population dependent on increasingly scarce natural resources. In 2011, WWF and the International Rhino Foundation (IRF) have confirmed the extinction of the Javan rhinoceros (Rhinoceros sondaicus annamiticus) in Vietnam. 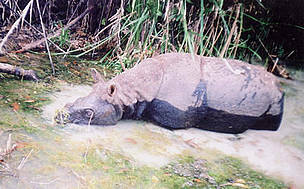 On 25 October 2011, WWF and the International Rhino Foundation (IRF) confirmed the extinction of the Javan rhinoceros in Vietnam.